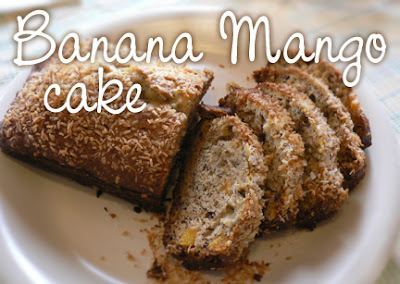 This light, tropical and delicious treat is a variation on banana cake (like banana bread but lighter and more moist). Make sure that you do not beat the ingredients, which will prevent it from rising. It is also essential to put the cake in the oven immediately after it's folded together. Lovingly shared by my friend Isabell. Preheat oven to 375F. Sift the flour, baking soda and nutmeg together. In a separate bowl combine sugar, oil, eggs, vanilla, lemon juice, mango and bananas. Mix thoroughly. Fold the liquid and dry ingredients together. Pout into a greased loaf pan. Scatter the coconut flakes on top. Place in the oven and bake for 35 minutes. The baking time will vary, depending on the size of the pan and the accuracy of the oven. To test the cake, place a toothpick in the center; if it comes out dry the cake is ready. When cool, slice and serve with a cup of hot chai! Originally this was the cake part of a trifle dessert. To make a banana mango trifle, cut the cake into cubes, place in a display bowl (or individual bowls or wine glasses) and cover with 2 cups honey-sweetened plain yogurt and dot with fresh sliced bananas, mangoes and coconut flakes. I love this recipe and many more. I can't have wheat, gluten or yeast. When you call for "flour" can I just use brown rice flour, or do I need to mix it with a thickener since there is no gluten? Do I need to add more baking soda/powder as well? Not sure how to do this...any advice would help.